On November 3 (tomorrow!) we will publish The Case of the Little Bloody Slipper by Carlie St. George–the first in The Spindle City Mysteries, a series of interconnected novelettes that will be published between now and December 15. Today, Carlie St. George is here to talk about the inspiration behind the first story. The thing is, I don’t know if there are a finite number of plots or not. Maybe. Maybe we are doomed to tell the same old tales over and over again— but I just can’t seem to get all that worked up about it because I like re-telling old stories. I like turning them on their heads, shaking them around, finding new ways to understand them. I find value in the deconstruction. Also, I can talk tropes till I’m blue in the face. 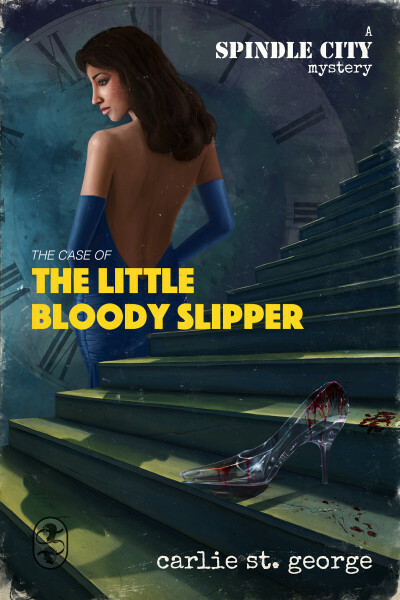 The Case of the Little Bloody Slipper started out as a random thought on a long bus trip (you know, from the prince’s point of view, Cinderella is kind of a mystery) and a sudden picture in my head (a bloody glass slipper, forgotten on the steps). And that was enough to set my imagination on fire because I was suddenly combining two of my very favorite things: fairy tales and detective stories. But that alone probably wouldn’t have held my interest for long because it’s not enough, I don’t think, to simply transport old stories across time and space. A new setting is cool and all, but it’s not really exciting in the long run. Transformation is exciting. You have to allow old stories to change. After all, that’s really the only way to make those stories yours. I wanted to write a story where women had power but had to wield it carefully, hidden behind subterfuge and shadow. I wanted to write about women who weren’t just sitting around, waiting to be rescued; they might need rescue, occasionally, but they couldn’t be helpless on their own. I wanted to write about women who chose to use beauty to get what they wanted, and also women who chose not to use beauty, and women who didn’t have beauty to use. I wanted to write about all kinds of women with all kinds of weapons at their disposal: money, blackmail, whispers, violence. And okay, I wanted to play with all those old tropes too: disreputable gumshoes, dangerous button men, handy girl Fridays, and mysterious femme fatales. Now, I got lucky because The Book Smugglers gave me the opportunity to write three of these stories, and believe me, I’m unendingly grateful. But I know I wouldn’t have been able to write any of them if I’d stuck too close to the original narrative. I think that’s one of the big problems with remakes today, Hollywood or otherwise: there’s no inherent problem with remaking a work; it’s just that you need to do something interesting with it, and man, there’s a limit to how many times I can watch Romeo & Juliet without the creators changing something fundamental. Juliet’s a robot? Neat! But that’s just a premise if you don’t actually do something else with it. You can’t be afraid to find your own endings. If you start an old story in a new world, that world should change the story— or really, why bother transporting it at all? So, that’s what I tried to do here, to take this old fairy tale and find myself in it, to let it to grow into something new and entertaining, something that I, myself, would want to read. Hopefully, you’ll find it entertaining too. Hopefully you haven’t heard this one too many times before.